Today’s buildings are entering a new era of change, one that focuses on performance and sustainability. As project stakeholders search for ways to minimize the operating costs and environmental impacts of buildings—not to mention an increased aim for LEED® certification—many architects are now specifying stringent energy performance requirements. 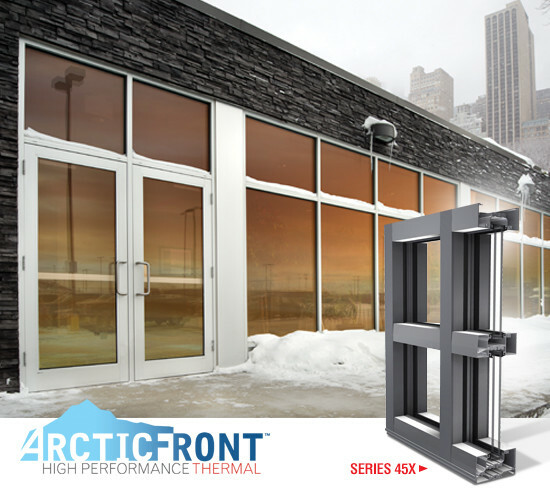 Keeping up with ever-evolving energy code requirements and meeting performance specifications presents a moving target, a challenge CRL-U.S. Aluminum has embraced with the launch of the new ArcticFront™ Series 45X High Performance Dual Thermal Storefront System. The ArcticFront 45X delivers optimal thermal performance with the installer-friendly features of a traditional storefront. A key component of the storefront is its dual polyurethane thermal break points that act as a superior thermal barrier and help the system meet energy codes. The ArcticFront 45X Storefront is a center-glazed system that features a 2” x 4-½” thermal frame. It has been tested to the highest industry standards for thermal performance and air leakage per AAMA 1503/507 and ASTM E283. The NFRC-rated ArcticFront™ Series 45X Storefront can produce U-factors ranging from 0.37 using 1″ low-E insulating glass, to as low as 0.19 using specially configured insulated glass units. Additional info, specs, and CAD drawings at crl-arch.com/arctic.